MAES Study Day 21/03/15: ‘The Power Behind the Throne’ – Key Personalities in Ancient Egyptian History. Dr. Campbell Price, Colin Reader and Sarah Griffiths explore who really pulled the strings in the ancient Egyptian court, from the Old Kingdom through to the end of the Late Period. Find out more about the lives and times of some of the most famous ancient Egyptian celebrities such as Imhotep and Senenmut and meet some of the lesser known powerful personalities of the Pharaonic era. The study day will be held at the Longfield Suite, Prestwich from 9:30am to 4:30pm, Saturday 21st March. There will be a raffle for charity, book auction to raise funds for MAES and a fun photo-spotting competition. 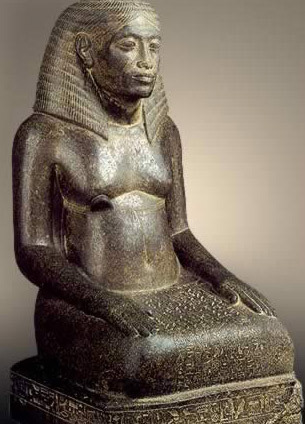 Texts in Translation #15: An offering table dedicated by Queen Tiye (Acc. no. 633). Like so many seemingly unassuming objects, this small (25 x 11 cm) black granite offering table carries an interesting back-story. It comes from the excavations of W.M. Flinders Petrie at the site of Gurob, the ‘harem’ complex used to house royal women and children in part of the New Kingdom (c. 1400-1200 BC). Manchester Museum holds many objects from Petrie’s excavations at Gurob, which is currently being reinvestigated by a joint project of the Universities of Liverpool, Copenhagen and UCL. One of the most famous finds to have come from the site is a small ebony head of Queen Tiye, the chief wife of Amenhotep III (c. 1390-1352 BC), now in Berlin. It is likely that the queen spent a lot of time at Gurob, and the inscription on our offering table suggests she lived here as ‘Queen Mother’ after her husband’s death. ‘Teacup Travels’ – CBeebies series features our objects! ‘Teacup Travels’ – CBeebies series features our objects!.